German WWII military radio equipment was characterised by its remarkably advanced and precise mechanical construction. Die-casting and machining techniques were particularly advanced. Many of these radios were built around a die-cast and precision-machined light-alloy chassis. Heat-producing components, such as vacuum tubes and power resistors, were thermally coupled to the chassis; the entire casting thus acted as a heatsink. This construction assured superb mechanical strength and rigidity, which contributed to far higher frequency stability than one might expect from equipment using free-running oscillators as frequency sources. The FuG 19 (15W.S.E.a) was a typical example. This HF transceiver was first deployed in 1941, and covered 3.0 to 7.5 MHz with 15W output (AM and CW). The left-hand photo, kindly provided by Helge Fykse LA6NCA, shows the FuG 19 receiver IF section. Each stage is mounted in its own compartment for RF shielding. The round black objects are tube sockets. A shield cover bolts on to the top of the chassis. 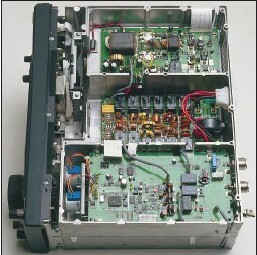 The right-hand photo shows the top side of the Icom IC-756 chassis. The die-cast alloy construction can be clearly seen. 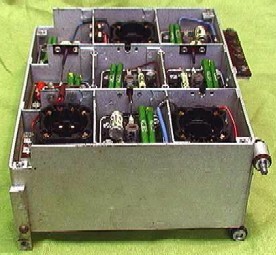 The PA (top of photo), transmitter LPF (centre) and ATU (bottom) modules are visible; each module is mounted in its own shielded compartment. The PA output and driver transistors, and voltage regulators, are thermally coupled to the chassis. A shield cover, bolted on to the top edge of the chassis, completes the RF-tight enclosure. The "family resemblance" is striking. Perhaps Icom's packaging engineers studied the construction of German WWII-era radio equipment. It is also possible that the concept of the heat-dissipating, die-cast, compartmented chassis is traceable all the way back to the wartime licensing of some German military electronics to Japanese firms. Text copyright © 2002-2018 A. Farson VA7OJ/AB4OJ. 15W.S.E.a photo copyright © Helge Fykse LA6NCA. IC-756 photo courtesy Icom Inc. All rights reserved.